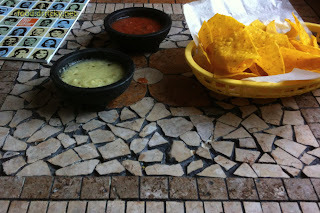 Science Based Cuisine: El Puebelito, the facelift? El Puebelito Place is a restaurant in my neighborhood that has recently undergone a facelift, and rechristened El Puebelito Patio. 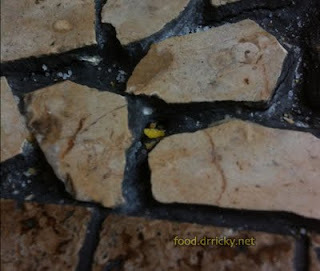 crumbs show up really easily in the crevices of the mosaic! that's the problem with having unsealed mosaics for table tops - you can't really clean them easily. How about the food? Well, this is the redfish with lime butter sauce. Fish was nicely cooked. 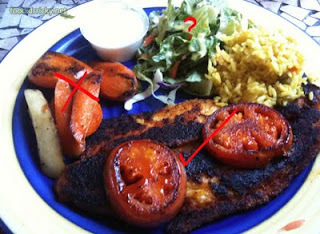 Tomatoes were fantastic, grilled but not mushy. Salad was generic meh. The roasted carrots were nearly inedible. The lime butter sauce was almost tasteless. So, it is a neighborhood joint, and hits the middle ground. I suspect that they're trying to push more into the "drinking and partying scene" though.